Pi.pe is a file synchronization service that had been invented to transfer any kind of picture file and any other type of file between the cloud storage present out in the market these days. Since after a year after it’s launch Pi.pe 50 million files have been passed through the severs of Pi.pe’s servers and as a result many a users have taken advantage of this service to backup transfer and share numerous number of photos. The newest thing is that we can now add “print” to that list of services that were earlier available. As the company Pi.pe has been on a roll since its inception, recently it started off a new service called Pi.pe Prints. 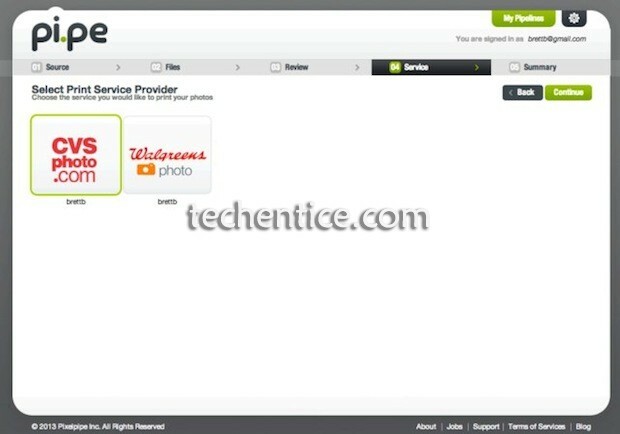 This service allows a user to select any number of photos available on a online cloud storage service or network and can get it printed via CVS or Walgreens. & VK(Russian Service).Google Drive is expected to join the list shortly. The only restriction in this feature is that the printing option available to the user are only CVS or Walgreens. Now since everyone has one of them nearby hence there is a bit of convenience. Pi.pe is already thinking of adding Shutterfly, Fuji Film & Tesco within a month’s time. CEO Brett Butterfield of TechCrunh also mentioned that Pi.pe prints will also be included into new brands such as Pi.pe iOS and Android Applications thereby including the user’s collection of photos to the list of services that the company provides. Now there is just one thing to watch out for. If Pi.pe Prints decides to include all the storage and printing options that it has planned forth, it would become a one-stop for everyone wherein they would store photos rather than taking out physical print outs of the pictures.